An annu­al cel­eb­ra­tion of apples. The Saturday will fea­ture apple advice and iden­ti­fic­a­tion from 10am whilst the Sunday will include apple juice tast­ing. See and taste a wide selec­tion of apple vari­et­ies from 12pm both days, and find out how to grow them your­self. This event is also run­ning from 10am — 4pm on Saturday 5 October. With the Royal Caledonian Horticultural Society. Sliding scale price from £45-£75 — but please don’t let money be the reas­on you don’t attend. Edinburgh Community Gardening Activists & PEDAL have teamed up to turn a large neg­lected garden area at the back of Porty Town Hall into a com­munity grow­ing space — Food ‘n’ Flowers! 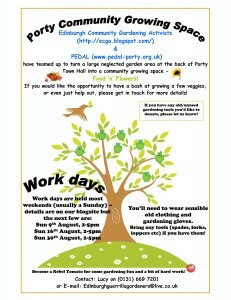 If you would like the oppor­tun­ity to have a bash at grow­ing a few veg­gies, or even just help out, please get in touch for more details! If you have any old/unused garden­ing tools you’d like to donate, please let us know! You’ll need to wear sens­ible old cloth­ing and garden­ing gloves. Bring any tools (spades, forks, lop­pers etc) if you have them! Become a Rebel Tomato for some garden­ing fun and a bit of hard work!